Google’s over-protective algorithms now filter all the suggestions that include “is evil”, “I hate”, “[ethnic group] are” (for example, “chinese are”). 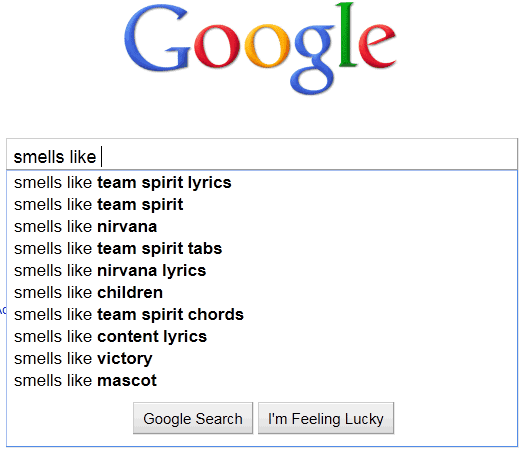 Google Suggest also filters “Smells Like Teen Spirit”, the name of a popular Nirvana song. “Queries in autocomplete are algorithmically determined based on a number of objective factors (including search term popularity) without manual intervention,” explains Google. Google Suggest’s filtering flaws are more obvious, now that Google Instant previews the results without having to press Enter. If you type [google is e], Google no longer previews the results and suggests to “press Enter to search”.